In the interest of aggregation, quick post linking the first two in a new series of astronomy articles on newyorkupstate.com and syracuse.com. 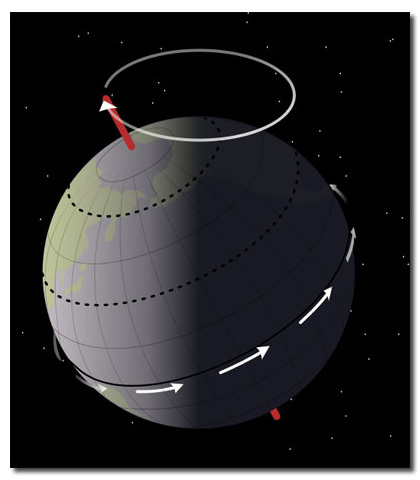 There’s an old adage in academia – “You don’t really know something until you can teach it.” To that end, these articles and their associated research prep are great fun and yet another excellent excuse to go out at night and compare the planetarium apps to the real thing (for which both Starry Night Pro and Stellarium are excellent organizational proxies. I’m currently leaning on Stellarium for the imagery because others who might get bit by the astronomy bug can download it for free and follow along. That said, Starry Night Pro is still my workhorse for fine detail as Stellarium continues to develop). When the article series was first proposed, the goal for the Syracuse Media Group folks was to provide people in upstate some basic information for what was up and about in the night sky – when you step outside, what’s there to find? My hope is to provide the non-observer and novice observer just enough information to whet the appetite, hopefully coaxing readers to take some quality looks and, if all goes well, to seek out their local astronomy club for some serious observing – and learning. Introducing the article organization, with first looks, spotting the International Space Station (ISS), moon phases, visible planets, and a constellation-a-month identifier to close it all. The series started just in time to highlight the Perseid Meteor Shower (and get its first linking to thanks to Glenn Coin’s article as we approached the Perseid peak), then August was chock full of interesting planetary events. The August article was also a first exposure to the issues of episodic astronomy – how to be as minimally referential as possible in any single article to previous articles (which is not easy given how much the search for constellations historically has involved the finding of a bright one to orient observers to a dimmer one). July hit 78 shares on newyorkupstate.com, August hit 4400 – at that rate, the whole world will see the October article. 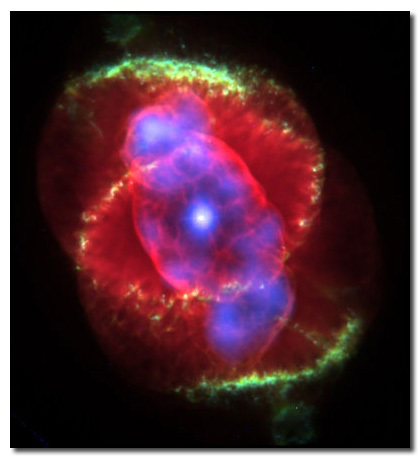 As first appeared in the July 2012 edition of the Syracuse Astronomical Society newsletter The Astronomical Chronicle. I have come to the conclusion that the constellation Lyra is my favorite, as it has all of the qualities one looks for in a celestial marker for a student of astronomy history, an amateur astronomer, and a part-time musician (well, drummer). Within its defined borders reside a famed double-double star system, a planetary nebula, a small globular cluster, at least one reasonable galaxy, one of the brightest stars in our night sky, a near-perfect parallelogram (if these were brighter stars, they would rival the Belt of Orion in geometric significance to terrestrial observers), one corner of the largest asterism in the night sky (the so-named Summer Triangle), and a host of other stars and dimmer objects (including even a few comets right now). This great variety of objects all lie in a small piece of property just off the band of the Milky Way and, during the summer, they are all ideally suited to near-zenith or at-zenith observing. For our overture, we begin with the history of this mythic instrument. Lyra has most oft been associated with the famed musician of olde Orpheus, where Orpheus’ lyre was disposed of in a river not long after Orpheus himself was disposed of by maenads despite Orpheus giving the performance of his life (or for his life as the case may have been, as his playing reportedly kept rocks and ï¿¼sticks at distance, requiring the maenads to forego accouterments and pluck Orpheus apart with their own hands). Zeus, with his ever-present eye for collector’s items, ordered the lyre placed in the heavens along with the eagle that recovered it (and some old drawings of the constellation still include a bird of some kind in the rendering). The show continues with the frame of the lyre itself, rendered in the opening image as a parallelogram topped by a “T.” When I see the constellation, I don’t see the “T” as much as I see an additional triangle composed of Vega, a Lyr (a double-star that connects the triangle to the parallelogram), and 1a/2a Lyr (far left of the image above, connected by the red line). 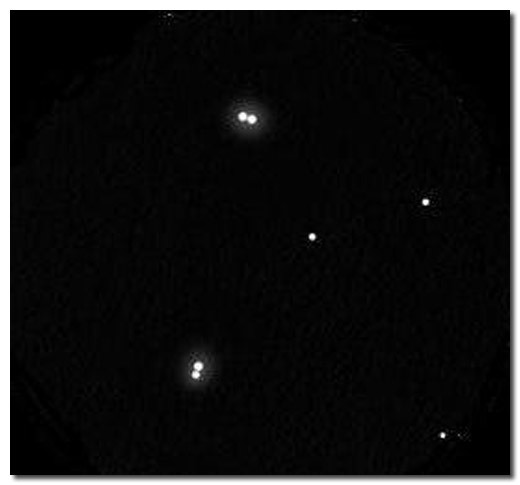 Now then, 1a/2a Lyr is a sight to behold in a telescope, as it is not one star, but instead a pair of binaries, meaning four stars total that resolve nicely under reasonable magnification (it is reported that, under ideal conditions, the two pairs themselves can be split naked eye). 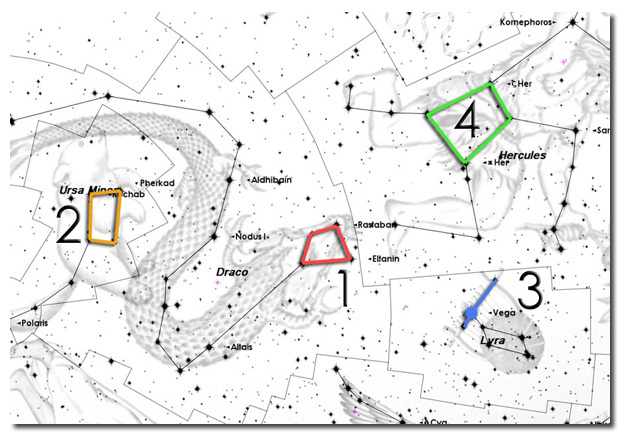 This famed “double-double” star is shown below in an image from the Harrison Telescopes website. Vega is the fifth brightest star in the Night Sky (making it the sixth brightest star in our sky) and is the second star to appear during the summer months after Arcturus. 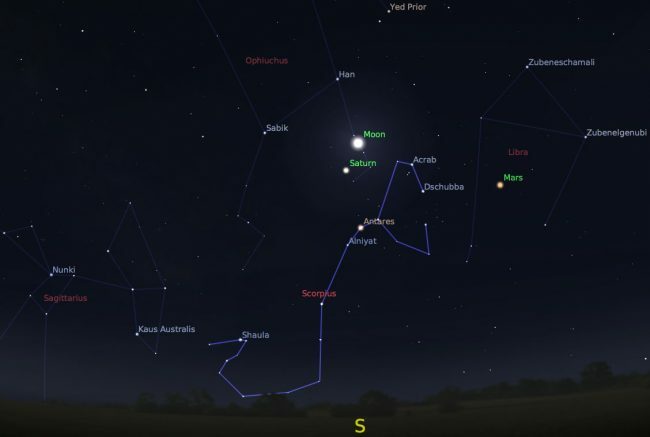 During June and July, Vega first appears high in the North-Eastern Sky and is obvious to anyone waiting at Darling Hill for their eyes to adjust after sunset. 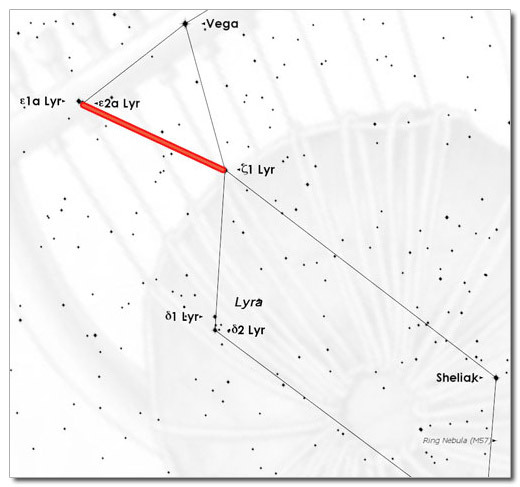 This makes Vega an easy marker for anyone learning the Summer constellations, which then makes Lyra an easy constellation to get under one’s belt at the same time. The parallelogram (where one might imagine the plucked strings of the lyre to be) is oriented nearly North-South and runs along the neck of Cygnus the Swan, a Constellation embedded well into the river of stars that make up the Milky Way. With the constellation of Lyra identified from its two prominent geometric themes, the search for the subtle tones in this constellation can continue. After M13 in Hercules and the famous M31, the object I learned to identify from the relative positions of stars was M57, the Ring Nebula. M57 sits like a tuning knob at the base of Lyra, almost centrally located between the binary star Sheliak and Sulafat. While far from the brightest object in the night sky, the Ring jumps out immediately even under low-power binoculars as something clearly not a pinpoint of light. New scope owners looking to find anything(!) 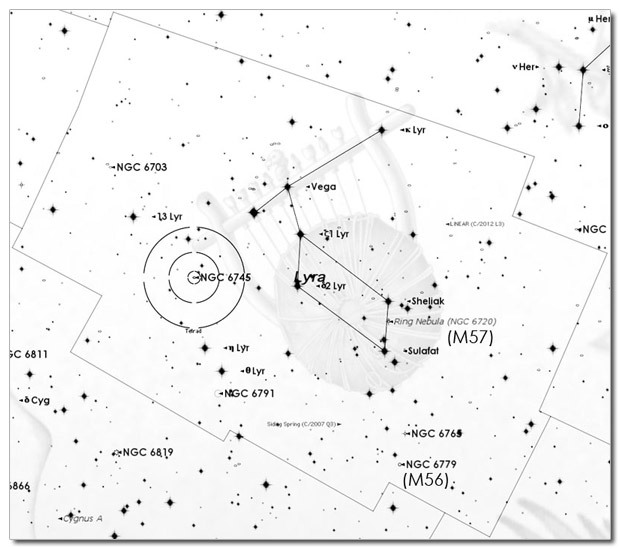 in their scope are well-advised to consider M57 as a target for low-magnification observing, as the appearance of Sheliak and Sulafat in an eyepiece help to set bright boundary conditions between which to scan for the nebulous ring. On ideally clear and steady nights, the central star of the Ring is visible, although this can be a heroic undertaking for even seasoned pros. 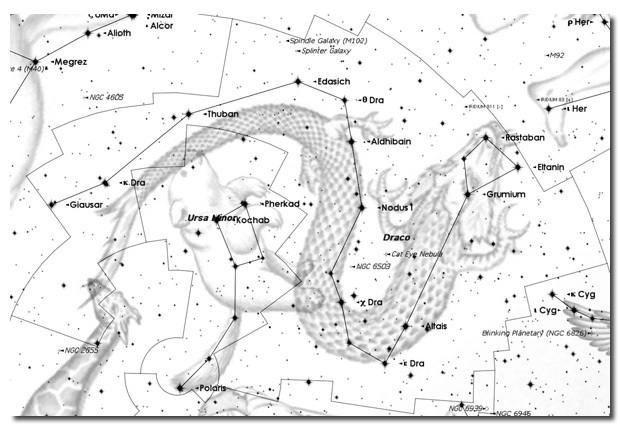 A comparison of what Hubble sees and what you’ll likely see is provided on the previous page. 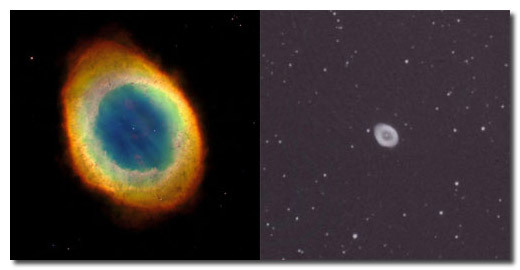 Containing the Ring Nebula would be enough for any constellation to be noteworthy to an amateur astronomer, but Lyra is famous as being a host to yet another Messier object in the form of M56, captured above-right by Stu Forster in July of 2010. 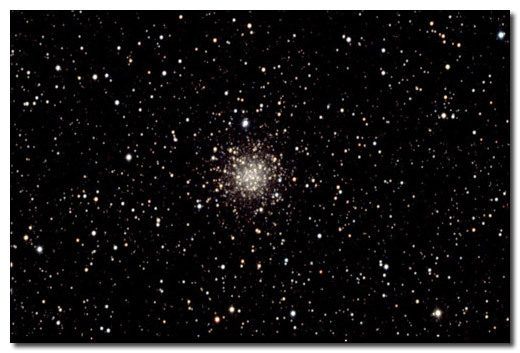 This small globular cluster has been tagged at 13.7 billion years of age and can be found most easily by drawing a straight line between Sulafat and Alberio (the head of Cygnus the swan) and scanning the midpoint with larger-aperture binoculars or a small telescope. 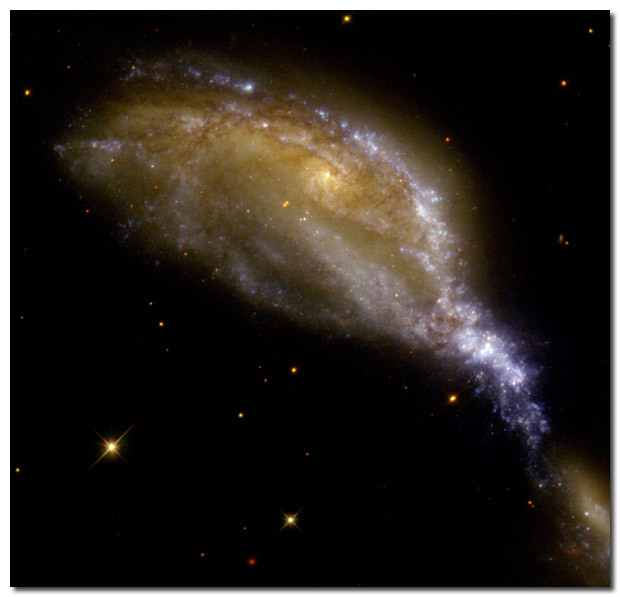 For those listening most intently to the orchestrations of this constellation, the irregular galaxy NGC 6745 is just visible in medium-sized telescopes (shown above from Hubble). NGC 6745 is decidedly less J. S. Bach and decidedly more John Cage, as 6745 is actually three galaxies in the process of a violent dance. Like a famous Big Band moving through a town of jazz combos, the largest galaxy is pulling stars from the two smaller galaxies, populating itself at the expense of the disrupted musicians. There are even themes implied but not heard that enhance the complexities of Lyra. 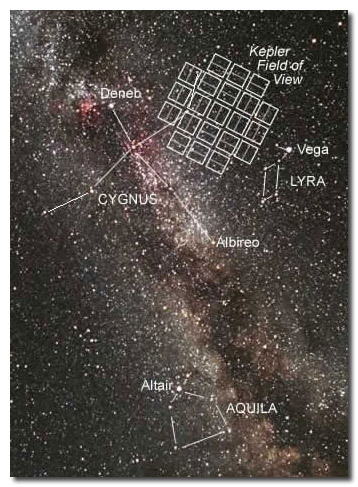 To date, over 13 exoplanets have been discovered in Lyra, at least three of which are attributed to the position of the Kepler Mission observing envelop just beyond Cygnus (see the image above, which shows Kepler frames just to the edge of Lyra).